I’ve been building out WetLand for 27 days, working closely with between 3-8 people daily. 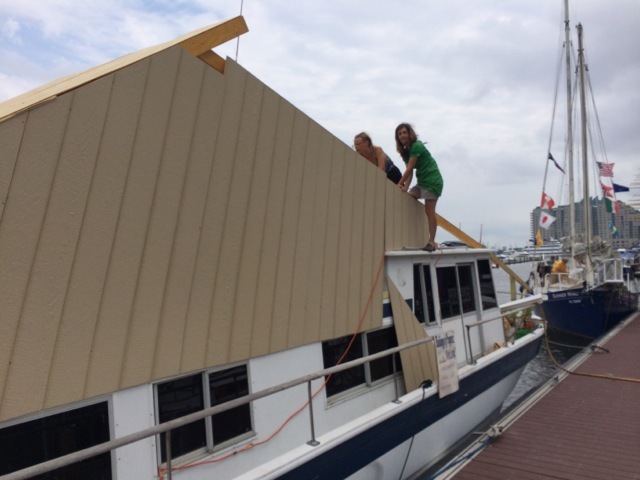 A nautical engineer, professional fiberglass painter, and professional boat shipper were brought on. A group of artists and art facilitators build and create the space together. We learn new skills as we go, and we teach each other what we’ve learned. Our individual hands are allowed to show in and on the structure. While WetLand began as a concept, at Day 27 it’s truly a collaboratively created sculpture. People have initiated structural and artistic changes to create something that not only functions as a sculpture but also as a home. Some of us already living onboard as we build, the space takes on characteristics of our own use and we create around it. Awaiting animals and jointly learning to create a human-made wetland has expanded our networks well beyond the formative group of collaborators and into the fabric of the city. Karla Stingerstein currently works closely with several nurseries to implement different growing spaces on WetLand, while Esteban Gaspar Silva is engineering tunnels and bridges throughout the space, from one level to the next. On site now, Greg Lindquist and Anna Ekros both vision different areas of the sculpture, using reclaimed wood and salvaged paint to begin articulating specific areas. A cohesiveness is created by repeating elements from one area through the next. Tongue-and-groove flooring rescued from a gym in Iowa comprises the flooring in the main space and also WetLand’s façade. Simultaneously building and living with a group is an intimate experience and lead-in to the public launch on August 15, where we will invite strangers into our space, and mutually share ideas.